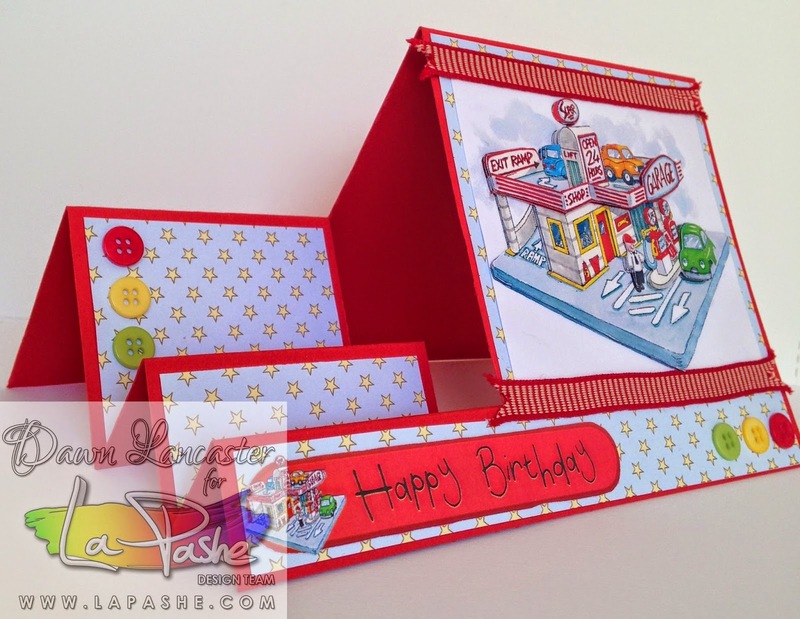 Today I'm sharing a La Pashe DT card with you! This is Toy Garage a fantastic sheet for boys of all ages I'd say! I've used it for a stepper card this time. available to pre- order now. Our latest Great Value CD-ROM featuring EVERYTHING we have done in 2014 since the release our last CD, Flippin' Families, at the turn of the year. The Grumps, Sports & Hobbies, Kids & Teens, Precious Moments, McDecoupage, Christmas, Vintage Men's Decoupage & much, much more! And it that's not enough, there are also more than 200 co-ordinating backgrounds, as well as lots of Christmas Toppers too! so keep your eyes peeled for more news! Here's a side view of my card. I added some ribbon & traffic light buttons. & will be available on the CD too! Thanks for popping in, I hope you like my card! Fabulous side stepper with a wonderful image! Love those gorgeous vibrant colours! Morning Dawn, I hope you have a wonderful weekend. 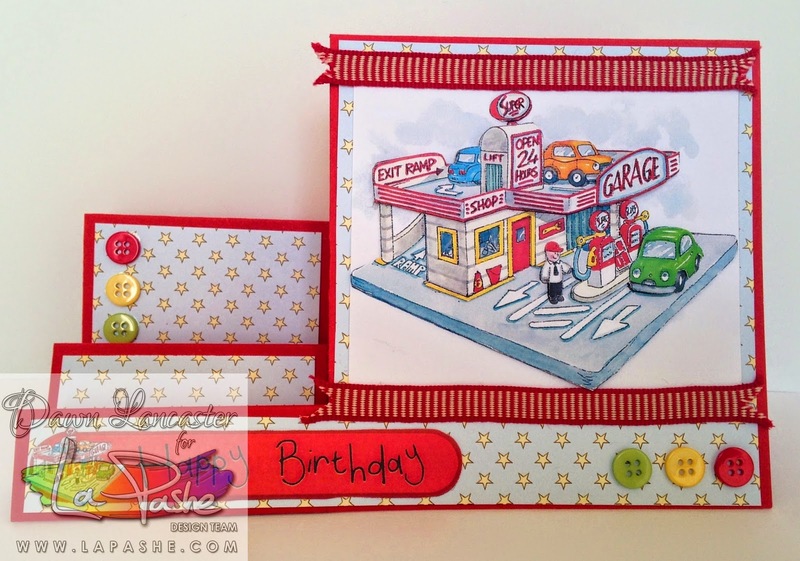 Your card is absolutely gorgeous, love the image and bright cheerful colours. Another great fun card Dawn. 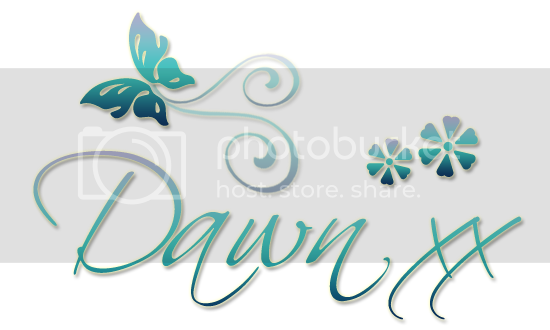 A fabulous card Dawn, I love your image - perfect for a little boy. Oh wow Dawn, fabulous card! Love the cute image! Brilliant card Dawn, love the colours...perfect for a young boy. Such a fun card, love the image and colourful buttons. Thank you for joining Sassy Studio Desings, good luck. Fabulous card. Thank you for joining us at Card Mania Challenge. Hope to see you again for the next challenge. I love step cards and forget to do them. This one is fantastic, Dawn! Great image and the bright colors are perfect for a child's card. Gorgeous and original card. Thanks for joining us at Card Mania Challenges. Good luck and hope you'll join us again. Wow your shape card is adorable so bright happy and great colors great add of buttons too..wonderfull card Dawn..